Extra! 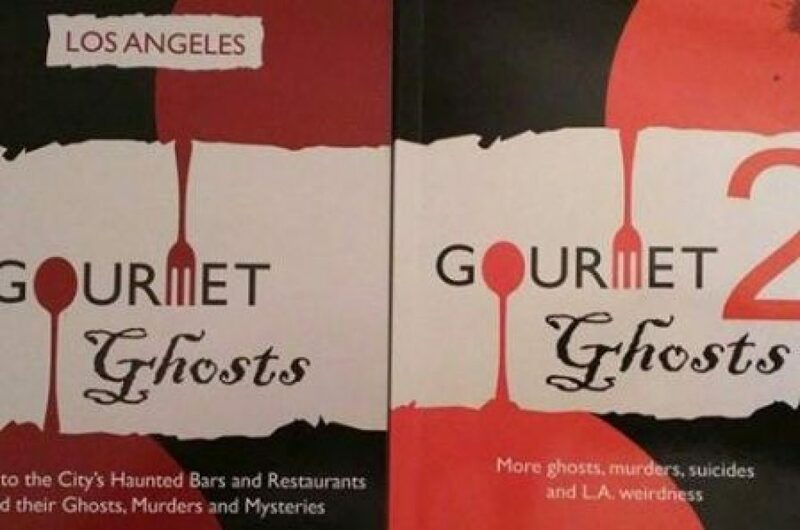 “Gourmet Ghosts” Down Under! I was in Australia recently – the city of Melbourne and the island state of Tasmania, which was an hour’s flight from Melbourne – and here are some of the interesting, weird and ghostly things I saw (and some tasty things too). First, some ghost signs; Shell’s Tea was in Hobart, Tasmania, the others Melbourne. I also paid a visit to the gorgeous Victorian Princess Theatre, which is famously – and proudly – home of the ghost of Frederick Federici, a noted actor who actually died on stage of a heart attack during a March 1888 performance of Faust. He was playing Mephistopheles and was stricken WHILE HE WAS DESCENDING IN THE TRAP DOOR DOWN TO “HELL”! The bistro beside the theatre is named after him (great bacon and cheese sanger! ), and there’s an excellent portrait of him made out of stainless steel wire in there, as well as other mementos from the theatre’s history. As for the ghost of Federici (real name Frederick Baker, who was born in Italy), he’s been seen many times by staff and actors over the years – they even keep a seat for him at every opening performance. Also in Melbourne was the Polly Woodside, a 130 year old sailing ship – an iron barque – that traveled the world many times over a decades-long career, and has been painstakingly restored and maintained. The Polly is docked permanently here alongside an excellent museum, and is over 90% original fixtures and fittings – it was also the place where 8 sailors were killed, an extremely low figure for that age of maritime travel. Alternatively, in Hobart I was lucky enough to get close to the massive icebreaker Aurora Asutralis, which smashes through the Antarctic ice many months of the year. Near the Aurora was the city’s famous Salamanca market, which we visited on a VERY windy day, and in one of the side streets was this great little book shop. I of course bought a book from him on UFO’s in the Bass Strait, the stretch of water between Tasmania and Australia that’s a famous ship’s graveyard; we learned about many of those wrecks – and a strange, unexplained one – at the Tasmania Maritime Museum. In Hobart we also saw the Tasmanian Tiger – or Thylacine – everywhere (even in the city’s logo). A marsupial that looked like a dog but with stripes, it could open its jaws almost 180 degrees, revealing a set of nasty teeth, but was wiped out by hunters after official bounties decades ago, the last dying in the local zoo in the 1930s. Thousands of apparent sightings in Tasmania and parts of Australia have persisted ever since, and in image alone at least, the Tassie Tiger is alive and well; we were tickled to see an official encounter kit from the 1980’s at the Tasmania Museum and Art Gallery, plus taxidermy Thylas and pictures that show their cruel demise, but also how cute – or scary – they looked. I drunk only Australian/Tasmanian beers during my trip, and one of them was a pint of Captain Bligh’s Lager at the Hope & Anchor in Hobart, which claims to be the oldest pub in Australia (circa 1807). The Cascade Brewery – definitely the oldest in the country – is in Tasmania too, but we didn’t make it there this time. Can you guess what’s on their labels? I visited several museums overall, and at the Victoria Police Museum in Melbourne there were artifacts and evidence from notable events including the remains of a car after a bombing, a set of armour from Ned Kelly’s gang and even a vampire hunter’s kit! The museum also had handcuffs worn by – and the death mask – of Edward Deeming, the English multiple murderer who killed his wife and four children in England, conned multiple people around the world, and ended up in Melbourne, where he killed his wife Emily Mather. Deeming was also, for a while, thought to be Jack The Ripper. I wrote about Deeming’s possible time in Los Angeles for the LA Weekly, and while in Melbourne I met Carly and Lee, the lovely people behind the Dead & Buried podcast, which looks at Melbourne history and crime. We recorded something about Deeming (due in the new series – download it on iTunes! ), and went to see if we could find the grave of Emily Mather, which we did (along with a stark warning etched on it). It was another great trip to Melbourne – and a real find in Hobart/Tasmania too – and I leave you with something that should bring a smile: my friend the Bunyip, who stands outside the National Gallery of Victoria, where W gave all her lectures for MIFF this year.